If you are in any way interested in Gothic or alternative footwear, you will know Pennangalan even if you've never heard of them. For many years they were the pinnacle of the 'Goth boot', based in London, producing high quality footwear in both leather and PVC. Shockingly high and heavily embellished, their shoes became the most coveted of all until their somewhat abrupt and not-quite-confirmed psudo-closure around 2015. Though their website is still up, many browsers report an unsecure site and won't load it. Customers can still check out and make payment, but their phone number is disconnected and their TrustPilot shows swathes of people who have paid £200+ for footwear they've never received. Their Facebook lies dormant and their brand is now a bit of a ghost. I say you'll know Pennangalan because many alternative shoe companies produce close imitations of their footwear. 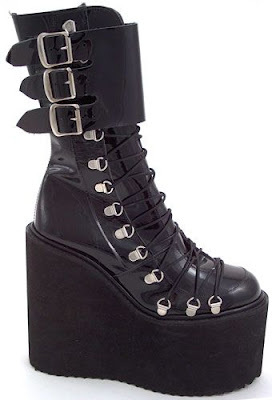 Most notably, Demonia (Pleaser) has a massive range of shoes based on their designs: the Swing, Trashville, Torment, Kera, Concord ranges, to name a few, are all clearly designed after Pennangalan shoes, always in PVC or PU. So, go into any Goth club and you'll see Pennangalan's influence on its dancefloor. The prevalence of 'knockoff' designs isn't just limited to Pennangalan and Demonia. Amy Nekrotique did a wonderfully informative video on YouTube about vintage Goth footwear and their modern-day counterparts (which absolutely inspired this post). It seems these reproductions are rife, and most people are blissfully unaware, praising brands for their covetable 'designs'. The reason I bring this up is because I recently purchased a knocked-off design after deciding that I couldn't risk spending my money with Pennangalan. I can't afford to have a couple of hundred pounds floating around in the ether and it felt like a waste of time to knowingly place an order that would end in a PayPal dispute. 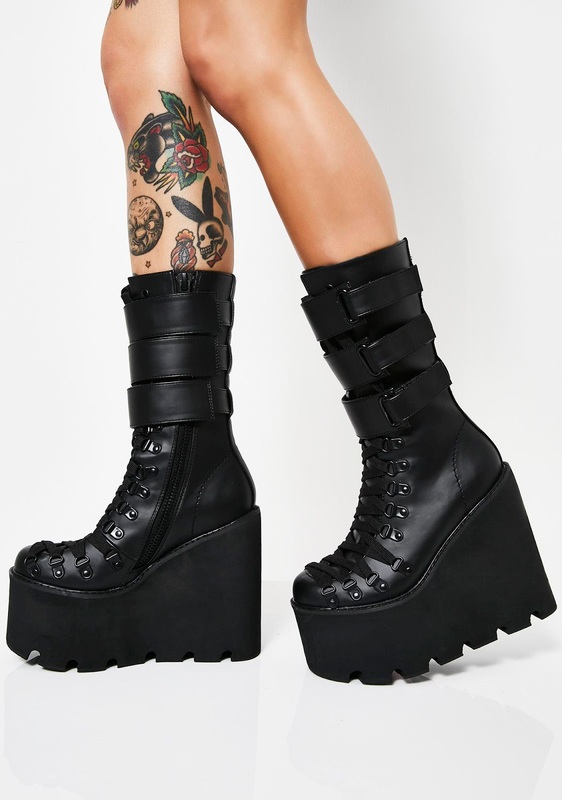 So, instead of the beautiful leather Mitch boots with the classic Lift sole, I bought the Current Mood Traitor boots. I opted for the 'Strapped' style as they were more in keeping with the Mitch, and because the standard Traitor was sold out. The similarity is pretty immediate, with the main differences being the colour of the hardware, the style of the laces, and the strap closure. The Traitors also come with white laces, which they are pictured with on the main product photo, although thankfully they come laced with the black. They're also made of matte PU whereas the Mitch offers matte and patent versions of their leather and vegan options. I am happy with the shoes I bought. They are lightweight, comfortable, satisfyingly vertiginous, and feel nicely put together. I will wear them for clubbing so I don't need to worry about their longevity as much as I would a pair of flat boots, though this is still a bit of a concern. The cleated sole gives them reassuring grip, and the straps, whilst a bit wide for my legs, look interesting and give the shoe a bit of extra height on the leg, differentiating them from the rest of my arsenal. However, I still feel guilty -- I do wish I could have purchased the originals. I want to support a small, independent alternative brand that makes good products! I don't want to support the theft of ideas and art. However I feel that if we can't buy the original item because it literally no longer exists, knockoffs are unfortunately the answer. I do hope that Pennangalan resurfaces as there is clearly a market for their products. My outfits have been extra boring recently due to this wretched sun but recently the temperature has dropped a bit and I couldn't be happier. Cool weather dressing is always so much more fun! My boyfriend described this outfit as that of a 'well-respected mortician' so consider my life made. I was a bit nervous about acquiring a white shirt(!) but so far I'm enjoying the look. Sadly I can't find a collage-worthy image of this old ASOS skirt, which looks a lot more interesting. I have also ordered a crossover bow tie, Judd Trump style, which has been on my Ali Express wish list for years. Exciting! I also like this outfit because the skirt is at least 6 years old, the shoes are secondhand, and the bow is a ribbon salvaged from a Biba carrier bag. Sustainability is something I've become a lot more mindful of this year and it makes for much more creative dressing. River Island skirt, Hawes & Curtis shirt, Topshop crop top, New Rock shoes, Alchemy earrings. 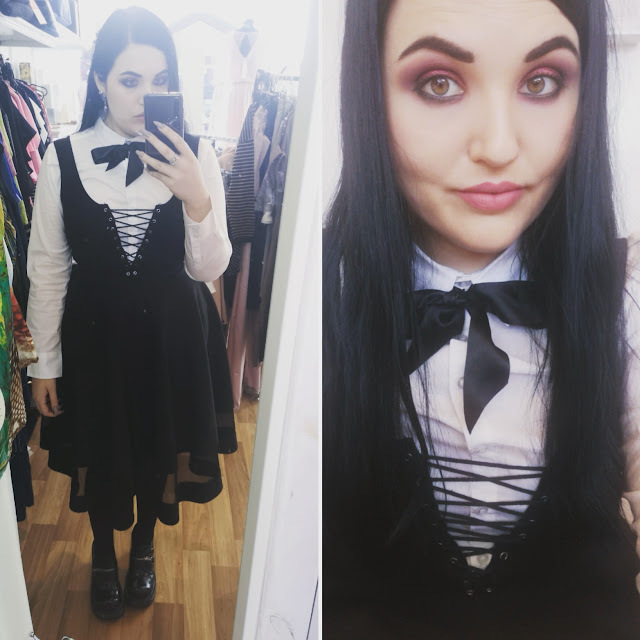 A very boring outfit, but I love this little sun dress by Killstar. It's very generously sized compared to their other styles and I almost wish I'd bought a medium, but I can always take it in if I need to! The lace has a beautiful, intricate celestial pattern and I'm tempted by a few more items in the range (although please can we be done with the cold shoulders?) as well as their gorgeous new velvet pieces. I'm just waiting on the next 20% off sale! Killstar dress, Pilgrim choker, Thomas Sabo and VaMoon rings, Great Frog bangle. Amassing a wardrobe inventory on Urstyle has really reminded me of some of the lovely things I'm lucky enough to own, but completely neglect. It's mainly due to my own haphazard dressing, as well as a fear of ruining things. For example, many of my Regal Rose pieces are tarnishing beyond recovery and so it makes me afraid to wear them (I am now painting all of their items with clear nail polish, which helps. They even deleted a review of mine from their website when I complained that a choker I had from them turned brown, so I fear I'm not the only one who experiences this. However I do love their designs so I shall persevere.) I'm also very sad that I can't find a good approximation of the beautiful black crocheted Monsoon cardigan I'm wearing, which I got for £5 on eBay. It is stunning! The bangle is also a close match to one my mum recently passed on to me. This Topshop dress was an impulsive sale buy, and it has proven to be exceptionally handy. I wear it at least a couple of times a month as it takes me from work to an evening activity feeling appropriately dressed for both. Also, velvet. Topshop dress, Loungeable Boutique cardigan, Pamela Love earrings, Underground brothel creepers, Regal Rose necklace, Great Frog bangle. What I wore to see Clan of Xymox on Saturday evening. The heat wave continues, but all this black mesh definitely made things easier. This was also my first outing in the Current Mood Strapped Traitor boots. Thoughts on those to follow, but they were comfortable until about the seventh hour on my feet! I also wore my silver armour ring for the first time in ages and managed not to lose it. Success! I actually planned this outfit in advance using Urstyle and it was both perversely fun and very convenient! I will fully admit to being both an outfit planner and a spontaneous dresser depending on how together my life is, but this saved me so much time. 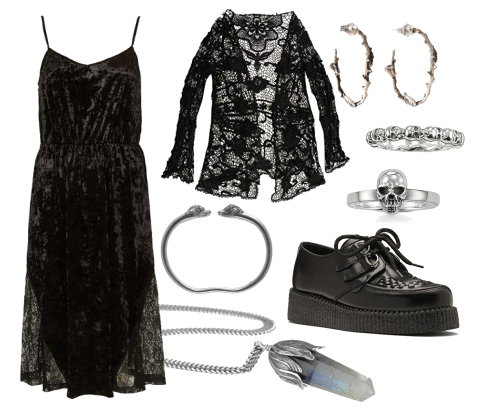 Boohoo mesh kimono, H&M top and skirt, New Look belt, Current Mood boots, Alchemy bag and earrings, rings by Regal Rose, Thomas Sabo, and Grit & Glamour. My name is Harley. 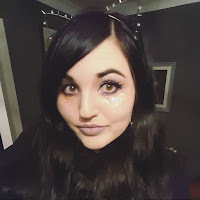 I am an awkward Goth girl from Scotland who is terrible at blogging. I have three cats, and I love reading, music, fashion, makeup, Magic: the Gathering, and everything spooky.